Puddle jumper is a game celebrating the miracle of flight, one of the foremost inventions making our world seem as small as it does. In Puddle Jumper, passengers have taken instant gratification to the extreme and now expect to be ferried between destinations in just seconds. As a new airline your business model adjusts airfare based on the time it takes to reach a destination. The faster the passengers arrive at their destination, the more you get paid. Passengers waiting too long at an airport will give up and leave, costing you potential income and slowing your progress towards becoming the world's fastest and biggest airline. Select a plane by left-clicking on it or pressing the numbers 1 to 4 on your keyboard. 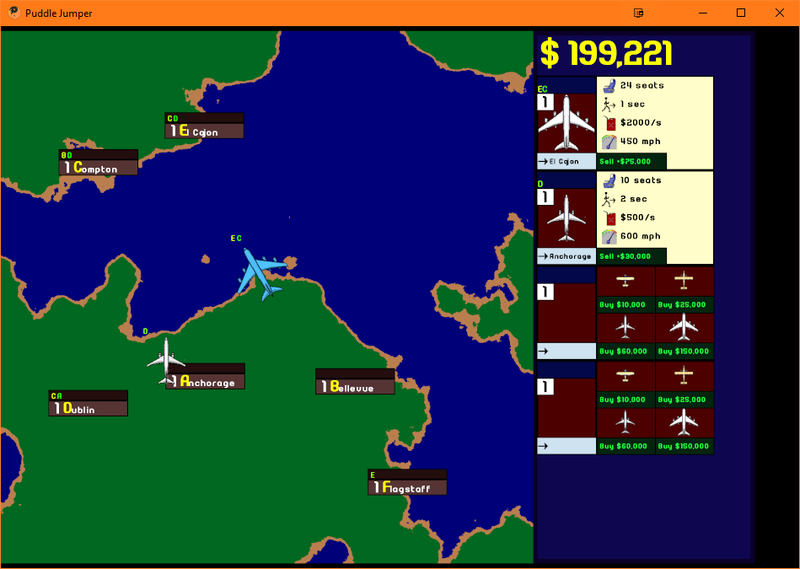 Tell the selected plane where to go by right-clicking a city. Cities spawn on the map and start with consecutive letters (the first are A, B, and C). 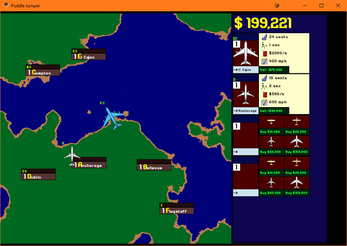 Passengers spawn at each city and are represented by a letter appearing above the city. The letter lets you know which city they are heading to. When a plane has room and it is at a city, passengers will get on the plane (and their letters will appear above the plane). Fly the plane to a city. While flying planes use fuel. Passengers turn from green to red as they get impatient. Passengers waiting at a city will leave if they get too impatient. Passengers pay you for the trip once they arrive at the destination. The faster they get there, the more you get paid! The theme for Ludum Dare 38 was A Small World.